Wn08 Redoute d'Audouville la Hubert. 1 x Ic125 mortar Tobruk. 1 x ringstand mortar Tobruk. 2 x 8cm Mortar Gr.W278(f). Uncle Red Beach early Bigot map. This is where the Americans were supposed to land straight onto Wn08. Although it was not a too stronger defence with only a field gun, a 4.7cm A/T gun, two 5cm KwK guns and two mortars. 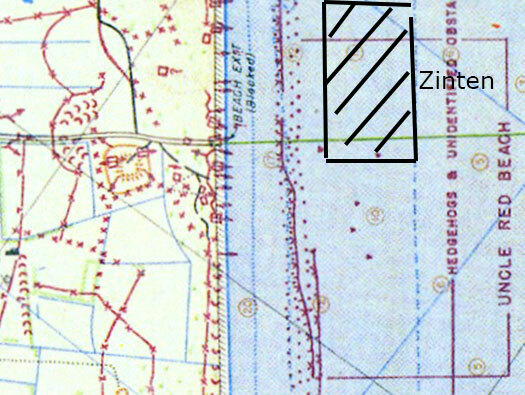 The main inland artillery batteries target for the beach area was Zinten. The Bigot map is very accurate and can be set against my plan and shows many of of the gun positions. US senior officers with clearance to Bigot files..
Another Bigot map 12 May 1944. TOP SECRET until issued for briefing ground troops; thereafter SECRET. 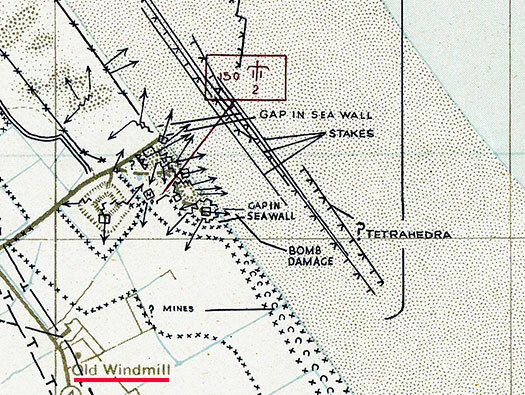 Another Bigot map showing even more detail and I have just noticed the Old Windmill also mentioned on the landings that should have been on the Americans left but could not be seen from Wn05. Rommel visiting the Normandy beaches in early 1944. Taken by ..........16 SQn. RAF. Ic125 Gr. W mortar Tobruk just outside the Fort. Plan of the Feldmassig. Completely removed. R501 Gruppe shelter with added Tobruk and extended wall. Plan of an R501 with attached Tobruk. Steps up to the Tobruk. A nice added extra. Inside the Tobruk a niche with a connecting pipe to inside the bunker for a speaking tube. Mouth piece for the speaking tube screwed onto the pipe. 491P2 Gittertür gate closing off the entrance. If attacked the machine gun inside in the close combat embrasure could shoot through the gate. This would have been closed off with a very strong 434P01 door. Crew room with the door coming in, the escape hatch through the wall and the close combat embrasure, now removed and just a hole left. Escape tunnel which should have a 410P9 door. At the far end were a set of shutters. All would need to be removed to crawl through. This is where the crew lived/slept in bunks hung from the walls and a folding table and chairs. The odd cupboard. The escape outside. Usually these are made of bricks but here its been formed in concrete. The two different types of escapes. Fitting for a radio antenna mast. How the telescopic aerial fitted through the bunker. This is an aerial still fitted into a bunker. Two mortar Tobruk's. One inside the Mud Fort and this one outside. Plan of the MD Tobruk ringstand inside the Fort. Ic125 mortar Tobruk. This one. The entrance is behind the small tree. Looking into the gun room with the entrance in front and niches around the wall for ready ammunition. Left entrance and look at the photographer. Gas lock. On the left and right are the aerial fittings then a 19P7 gas tight door with a small glass window. Gas lock looking into two entrances. One has a 19P7 door on the right and left a 434P01 heavy armoured split door. 434P01 heavy armoured door on the left. 19P7 door on the right. The left hand crew room to take one Gruppe of soldiers with bunk beds around the walls. Now who is this young man. Gas lock and way out. Entrance to the Tobruk defence. The Tobruk defence and also hooks for a camouflage net to hang. Fittings to hold a machine gun in a Tobruk. Now walking up the sand dune to the right flank of the defence. Probably through a mine field. Ringstand for a 5cm KwK L/60 gun. The first defence should be a Tobruk but we did not find it. This gun would have had a good view of D-day. That is if they had survived the bombing, shelling and rocket fire. This is where D-day should have started but as i commented I Wn05 due to the tide and mines they drifted south and hit Wn05 fair and square. With a 5cm gun the defenders here would have been hard pressed to hit very much landing at Wn05. But anything drifting this way would have taken a few rounds.. This is the Wn05 gun but its the sort of view that would have been seen from here. PilzÂ is German for 'mushroom'. A small pillbox defence. Vf/MG Pilz in northern Cotentin. Looking down into the entrance. Looking in to the entrance. This is as far as I got but others have noticed painting on the roof donating target information. The second ringstand covering the gap in the sand dunes and it was to become Exit 4. You can see how important Wn08 was. Right on the start of Exit 4 it was to become a very important route inland.. Very well camouflaged with only the lip showing, if it survived the initial bombardment, this machine gun could have done a lot of damage. 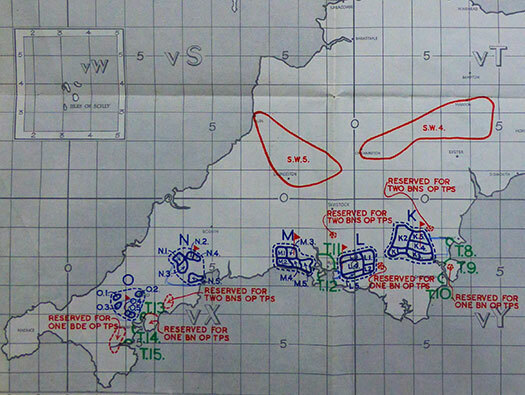 There were five Tobruk's here in Wn08. This is on D-Day (and a windmill now gone) what the Americans were looking for 'The Mud Fort'. The word Mud is the American way of saying earth. The Fort was an old 18c. 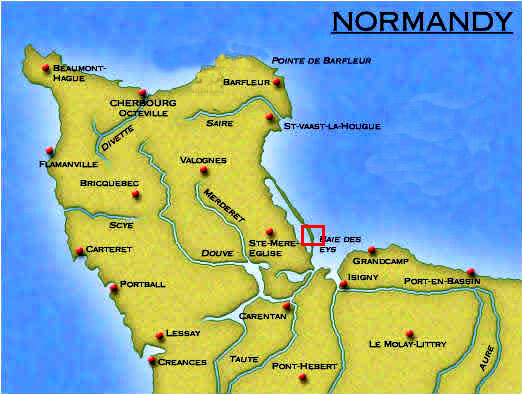 French fort protecting with the many others along this coast to stop the English, the enemy at the time from invading. As If. For October what a day. The real Atlantikwall. This wall ran along miles of this beach from north to south and like here sand has blown over it and protected it. Now the sea has started to wash it away. USS Tuscaloosa one of the bombarding ships. This may be an emplacement for the 4.7cm Pak 181(f). 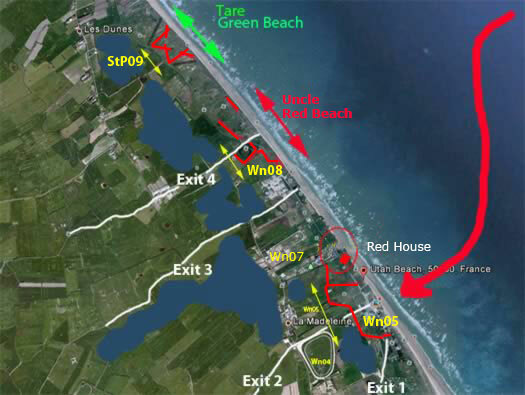 This is a plan of the concentration areas of the assault units for Utah Beach. The camps that they were sealed in prior D -2, the day they all started to move forward to the loading hards and board landing craft and assault ships. A.2. .............................Box in Assembly Area (Nos.1&2 Reception 3,4,&5 Marshalling Boxes). Red doted circle.........Reserved for Operation Troops. The camps were sealed with nobody going in or out. The troops were given some of the best food they had ever had in the army. They were allowed to rest, relax and do not marching. Plans, maps, photos of their targets were in a special hut or tent where any soldier at any time could go in and see the area they were to land and attack. The organisation was exceptional and roads were made one way to stop traffic jams. Then when they departed the moved to 'Hards' where they were loaded onto their craft from TLS, Assault ships to Landing Craft. Due to leave on the 4th June for a D-Day on the 5th June, but due to the weather, they left on the 5th June for D-Day on the 6th. Sealed inside a D-Camp somewhere in the South of England..
70th Tank battalion loading at Kingswear Ferry, Devon. Rame Head embarkation onto LST for Utah Beach. 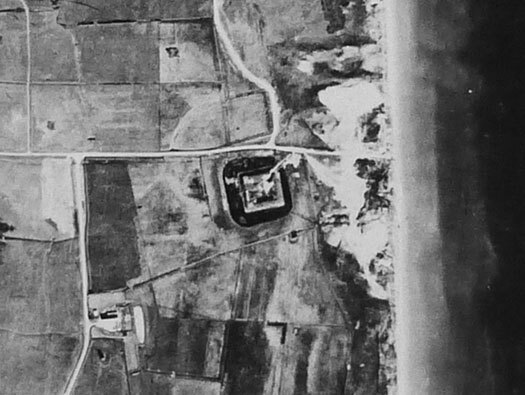 The D-Day beach markings laid out on this air photo. 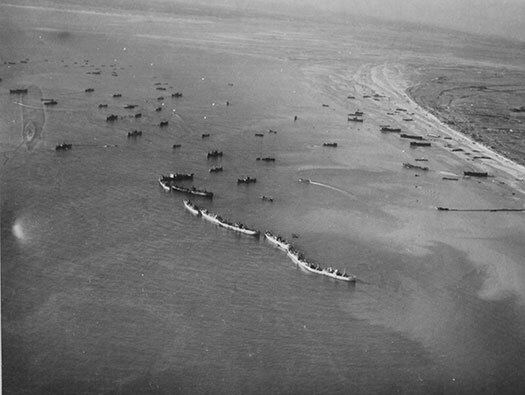 Infantry and tanks working up the coast. The American advance north up the coast and inland. The 3rd Battalion of the 22nd Infantry --- 3/22 moved north and was assigned the task of reducing the enemy beach strong points. 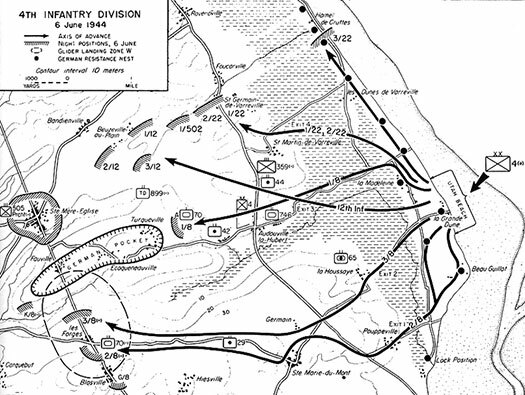 The Battalion moved north past les Dunes de Varreville and Exit 4 (Wn08) and reached the southern edge of Hamel de Cruttes by night fall. (Utah Beach to Cherbourg). So that means they took Wn08 & StP09 on D-Day. The Gooseberry a code name for sunken ships on Utah beach to create a sort of harbour for landing craft running in and out of the beach. The ships were redundant time served. The layout of the Utah Gooseberry, the sinking of several ships to act as a harbour on the beach. The SS West Honiker a surplice transport sunk onto the sea bed. An air view of the Gooseberry.